The Cape de Verds Notebook takes its name from the archipelago in the North Atlantic Ocean, off the western coast of Africa. 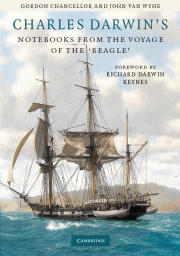 The notebook is the first of Darwin's Beagle field notebooks to be used and therefore contains his very first recorded observations during the voyage of the Beagle. Right from the opening pages the notebook contains a rapidly written torrent of calculations, geological sections, measurements of angles, temperatures, barometer readings, compass bearings, diagrams and sketches. As such it is an extraordinary document, which vividly records how in the initial weeks and months of the voyage Darwin was maturing from a mere trainee into an accomplished geologist who would be taken seriously by the specialists of his day. The notebook can be said to cover the first half year of the voyage, although it overlaps in April 1832 with the second notebook, Rio. The first dated entry in the Cape de Verds Notebook is for 18 January 1832, three weeks after the Beagle left England, and the last is for 10 June 1832. The notebook therefore covers his birthday in February when a very seasick Darwin turned twenty-three. The Cape de Verds Notebook deals firstly with the volcanic Cape Verde Islands, [Republica de Cabo Verde]. The previously uninhabited islands were discovered and colonized by the Portuguese in the fifteenth century. Darwin later realised that the animals and plants bear a close relationship to those of the neighbouring continent of Africa. When visiting the volcanic Galapagos Islands three and a half years later, he saw for himself how the animals and plants there were different from those in the Cape Verdes, yet obviously bore an identical relationship to those on the neighbouring continent of South America. See introduction to the Galapagos Notebook. The significance of these relationships became clearer to Darwin in the months leading up to his return visit to the Cape Verdes in September 1836, as he pondered why these otherwise similar volcanic archipelagos were populated by such different animals and plants. The Beagle arrived in the Cape Verdes on 16 January 1832, after twenty-one days at sea, and spent twenty-one days in the islands. 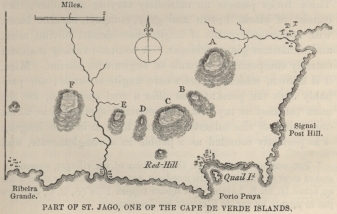 In his Autobiography, p. 77, written for his children and grandchildren forty-four years later, Darwin recalled how 'the very first place which I examined, namely St Jago [Sao Tiago] in the Cape Verde Islands, showed me clearly the wonderful superiority of Lyell’s manner of treating geology, compared with that of any other author, whose work I had with me or ever afterwards read.' Darwin had immediately plunged himself into theory, lapping up the first volume of Charles Lyell’s highly important new book Principles of Geology (1830), which was given to him by FitzRoy. Much has been written about Darwin’s geologizing at St Jago, most recently and in most detail by Pearson and Nicholas 2007. Herbert 2005 devotes a whole section of her book to his collecting and recording of sections and specimens and provides photographs of his actual specimens. They can be seen today at the Sedgwick Museum of Earth Sciences in Cambridge. Herbert explains how the young Darwin appropriated Lyell’s method of geological interpretation, which was based seeking causes and degrees of change currently occuring (erosion, earthquakes, volcanoes etc.) a method known as actualism. Lyell’s particular version of actualism, which later became known as uniformitarianism, argued that in reconstructing the geological past one should assume that the intensity of such causes of change had been more or less uniform throughout time. See Rudwick 2008. Darwin applied Lyell's method to unraveling St Jago’s recent volcanic past, especially in relation to Quail Island [Santa Maria] and Flag Staff [Signal Post] Hill. There a band of limestone exposed in a cliff and obviously composed of marine fossil material and now elevated well above sea level, provided clear evidence of past subsidence and uplift. Fig. 1 from Volcanic islands. Part of St Jago, one of the Cape de Verds. The Cape de Verds Notebook records Darwin's on-the-spot geological section on the very first page (p.1b). After his disappointment at not being able to go ashore at the Canaries, to see for himself the wonderful sights described there by Humboldt and dreamed of in Cambridge, Darwin was ecstatic to find that his geological skills were good enough to understand almost immediately what he was seeing in the Cape Verdes. In the long run Darwin’s Lyellian conversion was perhaps unfortunate for John Stevens Henslow, who recommended Darwin to read Lyell’s book, and who acted as his scientific champion before and during the voyage. Henslow might have taken the Captain’s offer of a place onboard himself if domestic commitments had not prevented him, and may in some ways have regretted that Darwin’s experiences on the voyage eventually turned him away from the traditional theory of the Earth's history as a series of cataclysms. Henslow had, after all, asked Darwin to read Lyell’s book, but ‘on no account to accept the views therein advocated’. (Autobiography, p. 101.) Which of Lyell's views were not to be accepted is not entirely clear. When Darwin revisited the Cape Verdes in September 1836, he struck through parts of his foolscap 1832 geology notes from the islands (now in DAR32), especially their discussion of 'the long disputed Diluvium' i.e. deposits which some still took to be relics of the Noachian flood, and we can judge from this the extent of his increased commitment to Lyell’s actualistic methodology. This methodology was to remain a cornerstone of Darwin’s own for the rest of his life. He had seen (and experienced) enough evidence of the forces at work on the Earth’s surface fully to accept Lyell’s explanations. For further discussion of Diluvium see the introduction to the B. Blanca Notebook and Herbert 2005, p. 397 note 59. Although Darwin accepted Lyell’s actualistic methodology, he came to reject Lyell’s uncompromising belief in a steady state or non-directional (‘uniformitarian’) Earth history. In the second volume of Lyell's book, which Darwin read at the end of 1832, Lyell argued, applying actualism, that since no one had ever seen a new species appear by natural means the origin of species must be some sort of supernatural process. Since new species seemed to appear regularly in the strata to replace those which became extinct (to maintain his steady state Earth), there must be ‘centres of creation’ to explain the appearance of new species in new environments. Darwin had, by 1836, realised that the fact that the plants and animals on the Cape Verdes were of an African cast was because that is where they had originated. Any Cape Verde ‘centre of creation’ was a fiction. The diagram on the inside front cover shows how FitzRoy used his sextant to help Darwin calculate the height of a Baobob tree. A very similar diagram occurs in Darwin’s Beagle diary, p. 29, entry for 20 January and the accomplished sketch on p. 5a is almost certainly the one Darwin mentioned in his Beagle diary as by FitzRoy. There are also references on pp.10a and 40b to Robert McCormick, the Beagle’s surgeon (the role normally doubling with naturalist).The first known use by Darwin of his wonderful word ‘entangled’ occurs on p. 17b. See Herbert 2005, p. 397 note 7. This word is evocatively used in the last paragraph of Origin, p. 489. From the Cape Verdes the Beagle crossed the equator and called at St Paul’s Rocks [Penados de Sao Pedro e Sao Paulo] on 16 February. There Darwin could immediately see that the Rocks were not volcanic (see Armstrong 2004). The Rocks are in fact still of great geological interest since unlike almost all oceanic islands they are indeed non-volcanic and Darwin’s specimens are still valued for this reason today. See Barlow 1967, p. 54, and Herbert 2005, p. 116. On p. 77b Darwin compared a gneiss rock he saw on St Paul's to one from Bahia, and on p. 49b he noted the layer of St Paul's ‘dung’ [guano] which coats the rocks there, which he later described in Volcanic islands p. 45. The wonderfully evocative line from p. 46b is from the sea passage south after this stop, and is dated 25 February. The title of this introduction is taken from that passage. The following ten pages of the notebook seem to be reflections on geological features previously seen, with Darwin exercising his strengthening theoretical muscles while cruising at sea. The Beagle was next stationed for nineteen days at Bahia [Salvador] where, for the first time, at the end of February, Darwin experienced the natural beauties of the tropics. There are many traces in the notebook which give a hint of his exhileration at the time of writing and which are developed in classic pages from his Beagle diary. Many of these he published to great acclaim in his Journal of Researches in 1839, or have since been published in the letters he wrote home (see Correspondence vol. 1). In Bahia Darwin had his first taste of the New World proper. Here he first encountered the ‘Primitive’ [i.e. ancient] igneous and metamorphic rocks of the Brazilian continent (see for example p. 56b), albeit covered with the more recent ‘Diluvium’ See Pearson 1996. On p. 72b he switched finally to 'gen[eral] obs[ervations', i.e. not geology, describing a delightful interaction with some apparently aggressive ants, and attempting a sketch of a spider’s web. The Beagle left Bahia on 18 March for a cruise down to Rio where she arrived, via an examination of the Abrolhos islets, on 4 April. There is a dramatic demonstration of the enduring value to Darwin of his field notebooks in the 1 November 1839 letter he wrote to Humboldt (Correspondence vol. 2, p. 239) in which he copied out the depths and temperatures of the sea off the Abrolhos from p. 13a of the notebook. He expanded on this in his section on Rio in South America, pp. 142-4. There is a letter from Darwin to his second cousin William Darwin Fox, dated May 1832 and today preserved at their old Cambridge College, Christ’s. In it Darwin tried to convey his excitement at geologizing: 'it is like the pleasure of gambling, speculating on first arriving what the rocks may be; I often mentally cry out 3 to one Tertiary against primitive, but the latter have hitherto won all the bets.' (Correspondence vol. 1, p. 232). Henslow received a letter from Darwin written in Rio on 18 May 1832 from which he read extracts (together with extracts from other letters from Darwin) to the Cambridge Philosophical Society in November 1835. These were printed as a pamphlet dated 1 December 1835 which was Darwin’s first true scientific publication (Darwin 1835). Henslow sent copies to Darwin’s father and these had the affect of convincing Dr Darwin that his son would one day make a handsome return on his father’s investment in the voyage. The pamphlet also ensured that Darwin was being discussed in scientific circles back home. Darwin first learnt of the pamphlet in a letter from his sister Catherine which he did not receive until June 1836. He was at first horrified by the news as he would have preferred the chance to check the extracts for accuracy, but quickly realised that this was a minor issue: 'after reading this letter I clambered over the mountains of Ascension with a bounding step and made the volcanic rocks resound under my geological hammer!' (Autobiography, p. 82). In Rio Darwin was finally able to settle down for a period of three months, partly as an unplanned bonus from the Beagle's needing to return north to Bahia to check a longitude discrepancy. See Correspondence vol. 1, p. 227. It was while the Beagle was away that three of Darwin's ship-mates, including the young Charles Musters, died of malaria. The last entries in the Cape de Verds Notebook, from about p. 76b, were made in Rio, as Darwin started to collect new species of animals and plants as well as rock samples. See the excellent summaries of his zoological and botanical collecting from Rio provided by Barlow, Keynes, Porter, Smith, Steinheimer and others and all available on Darwin Online. These Rio entries overlap with the Rio Notebook which deals with Darwin’s famous excursion to the plantation where he encountered the realities of slavery. The last lines in the notebook, on p. 85b and dated 10 June, are among of the most poetic and beautiful Darwin ever wrote.